Tableau Vivant \\ Lelutka HB 05 @kustom9 New!! 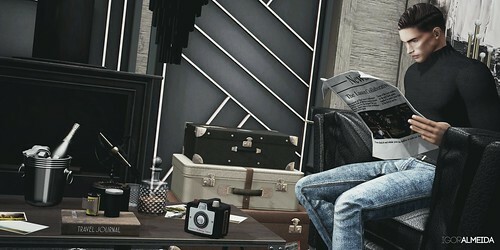 shi.s.poses BENTO male #20 @ href="https://maps.secondlife.com/secondlife/The Liaison Collaborative/105/125/25" rel="noreferrer nofollow">the liaison collaborative New!! shi.s.poses BENTO male #20 - N wear @the liaison collaborative New!! [Bad Unicorn] Lonely Lodge @Fameshed New!! SAYO - Geometric Wall Panel - 02 @Fameshed New!! [Merak ]- Champagne Bucket @belle event New!! [Merak ] - Napkins @belle event New!! [Merak ]- Whiskey Bottle @belle event New!! [ kunst ] - Horizon seat (PG) @Fameshed New!! [ kunst ] - Horizon table @Fameshed New!! ..::THOR::.. Stacked Luggages @the liaison collaborative New!! ..::THOR::.. Camera @the liaison collaborative New!! ..::THOR::.. Astrolabe @the liaison collaborative New!! ..::THOR::.. Travel Journal @the liaison collaborative New! !